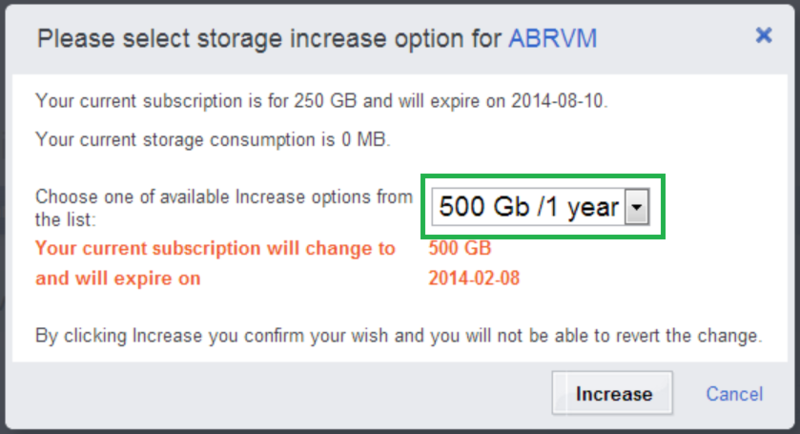 Acronis Cloud storage quota can be increased free of charge in My Account section on the Acronis Webpage. The remaining subscription period is reduced in proportion to the capacity increase. Acronis Backup to Cloud quotas are described in this article. On demand the quota on an existing subscription can be increased without buying a new one. The remaining subscription period is reduced in proportion to the capacity increase. This option is not available for volume subscriptions, the storage quota for a volume subscription can be changed by purchasing a new larger subcription only. 4 months * (2TB/4TB) = 2 months of 4TB storage quota. It is possible to increase quota only to a quota available as a subscription (E.g. 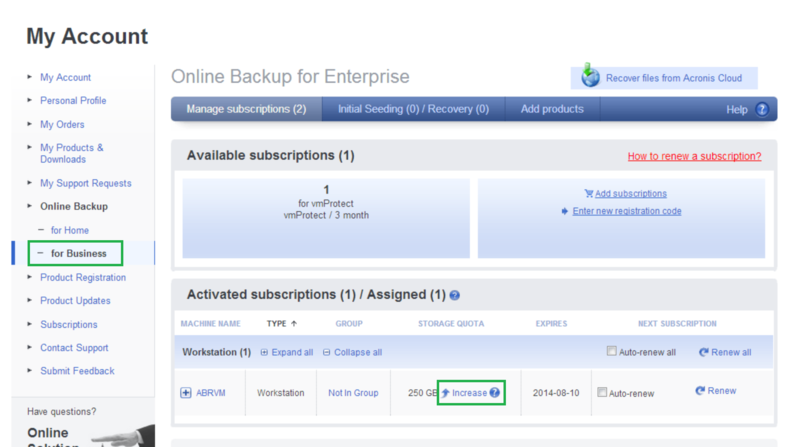 Acronis Backup for AnyServer to Cloud can be increased to 4TB, 6TB, 8TB, or 12TB but not to 3TB or 3,5TB). The increase feature can be used for a subscription that is already assigned to a machine. Subscription type (PC, server) can not be changed during the Increase operation. Log in into My Account on the Acronis Webpage. Select the machine for which you want to increase a storage quota. Click on the Increase option. Choose one of the available options from the list. The increase operation is irreversible. Decrease operation is currently not available. An expired increased subscription can be renewed the usual way by purchasing and assigning a new subscription of the same machine type and capacity.